Until about the mid 20th century, there was a tradition for New York’s urban landscape painters to split time between New York and Paris. 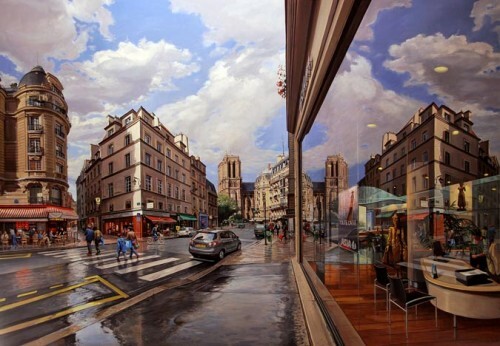 It was not uncommon for collectors to hang dual streetscapes side by side. It’s surprising then to see the digitally inflected work of Robert Neffson tweak the tradition for the 21st century. 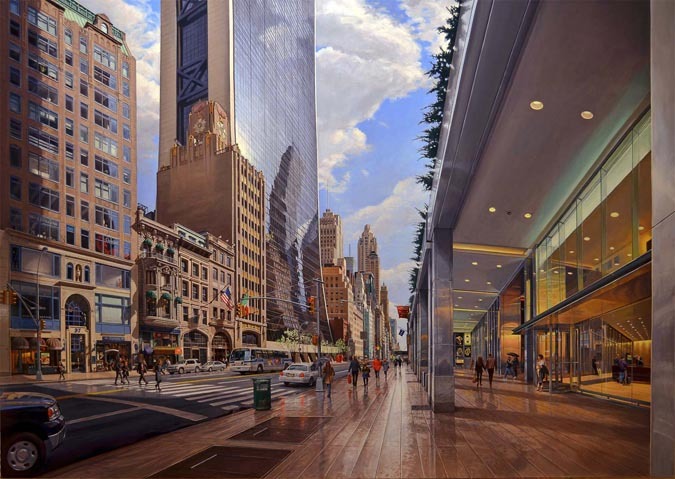 Neffson’s paintings of 57th Street and Notre Dame embrace a multimedia studio process for hyperrealistic results. The paintings build on digital photo technology which, through a series of stitched individual images, bring 180 degree perspectives into a single frame. It’s similar to the process David Hockney employed at his recent Royal Academy show in London. But while Neffson’s extreme perspectives could be perfected in Photoshop, the paintings’ plein air quality lends the stretched sightlines an honesty that digitally stitched panoramas lack. With an awareness of contemporary photography (Gurszky, Struth, and Crewdson), Neffson said he wants to take painting a step beyond, while maintaining an eye for the ordinary. His appreciation for architecture extends to its “anthropomorphic qualities” and how buildings “can be used as expressions of human emotions,” he wrote in an email. 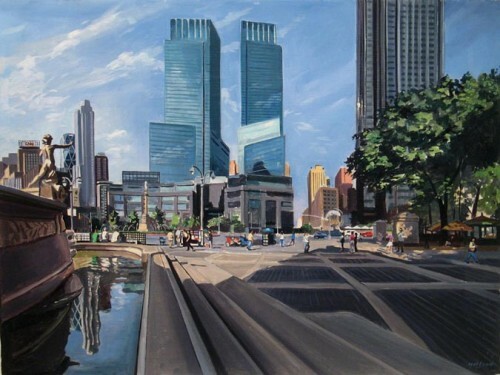 Another study in SOM, this one a small study of David Child's work at Columbus Circle (18x25 inches). Neffson’s work will be on view at Bernarducci Meisel through April 28th.